St. Patrick’s Day is March 17. That means that all over the world, people are taking to the streets and local public houses to celebrate the rich cultural legacy of Ireland. Rivers are dyed green, revelry abounds, and everyone is making or placing orders for that traditional Irish meal of corned beef and cabbage. Frequently served with helpings of onions, potatoes, and carrots, those who don’t enjoy alcoholic beverages will certainly chow down on this Emerald Isle favorite. 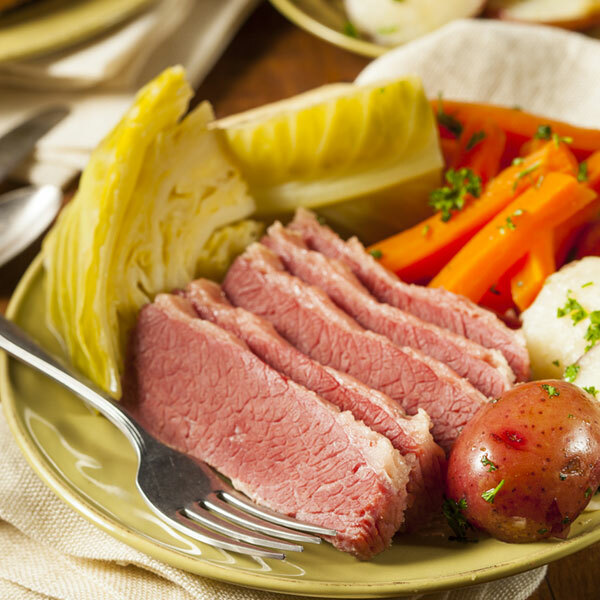 Before you hem and haw, you’re right, corned beef and cabbage is not at all a common Irish staple, nor was it ever. In times now long past, bacon and cabbage may have been eaten on a semi-regular basis by rural Irish, but only because cows were utilized mostly as dairy animals, and because pork was more readily available. Regardless, in America, at least, preparing corned beef and cabbage on St. Patrick’s Day is certainly a tradition. The question is, wherever you may be, can you share any part of this feast with your cats? Homemade Corned Beef and Cabbage with Potatoes and Carrots. Photography by Brent Hofacker / Shutterstock. 1. Can cats eat bacon? Let’s begin at the beginning, with the original bacon pairing. No matter how thickly or thinly sliced it is, a typical piece of bacon is cured or treated with copious amounts of salt, and often contains more than a small amount of fat. Since cats are proportionally smaller creatures than humans, the fat content of bacon alone renders a standard piece of bacon bad for cats. 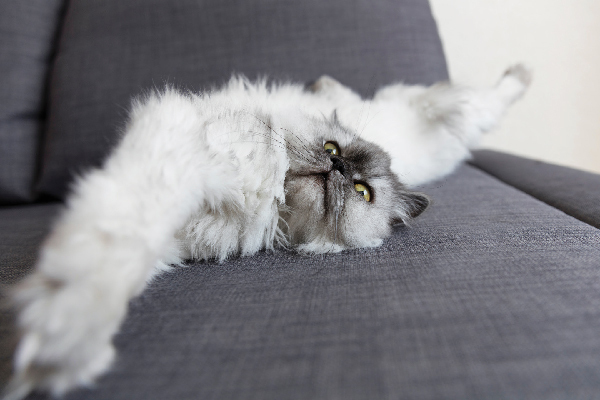 Excess fat can cause digestive upset in cats, and excess salt can cause cats to become dehydrated. If you feel you must share bacon with your cats and kitten friends, let it be a food specifically designed for cat consumption; there are plenty that are bacon-flavored that have neither the sodium nor the fat content of the bacon that people eat. 2. Can cats eat corned beef? Corned beef has an even higher salt content than bacon. Some recipes for corned beef call for the meat to be brined in rock salt, assorted spices and saltpeter for at least 10 days. During the brining process, sodium naturally seeps into every part of the meat. As with bacon, corned beef’s salt content can cause damage to a cat’s kidneys if ingested in large enough quantities. 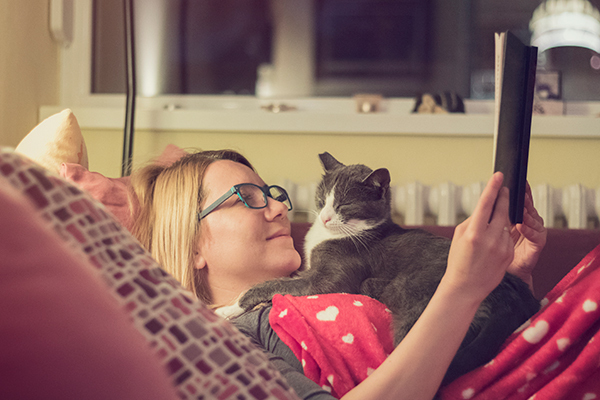 Because cats are proportionally much smaller than humans, it takes far less sodium to provoke a toxic reaction. This concerns corned beef you prepare at home or get from the deli. More caution should be taken with canned or tinned corned beef, which will doubtless contain a host of other chemicals and preservatives that cats are better off without. 3. Can cats eat cabbage? 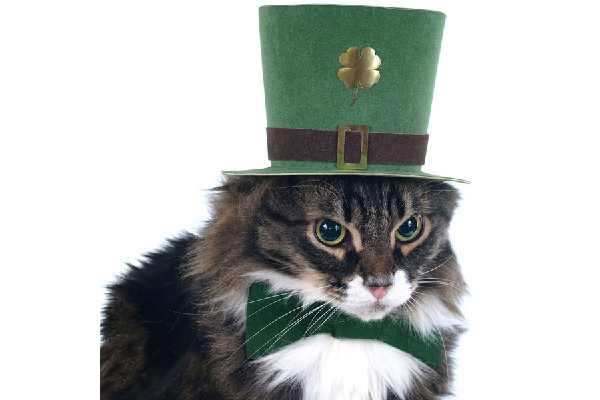 Can cats eat any human foods to celebrate St. Patrick’s Day. Photography by Viacheslav Zhukovskiy / Shutterstock. As Catster has addressed on multiple previous occasions, cats are obligate carnivores. Most of their nutritional needs are met in eating and processing meat-based proteins. We also know from looking at a standard bag or tin of store-bought cat food that plant matter constitutes at least some of what they eat, in a form they can easily digest. That said, if they will eat it, a little bit of cabbage now and then offers no substantive dangers to your cats. Raw cabbage does contain an anion known as thiocyanate, which can impair thyroid function, but it is highly unlikely that cats would ever deign to eat enough raw cabbage to do them any harm. The worst you can expect from a cat eating cabbage is an increase in gas. 4. Can cats eat carrots? Carrots are perfectly acceptable for cats to eat. Some sources recommend cooking or boiling them before offering carrots to your cats, operating under the assumption that raw carrots may be too tough for cats to digest. A cat’s digestive system is not structured to process nutrients from vegetable or plant matter, however. Even if your cat will eat bits of chopped up or cooked carrot, it offers them almost no nutritional benefits. 5. Can cats eat potatoes? 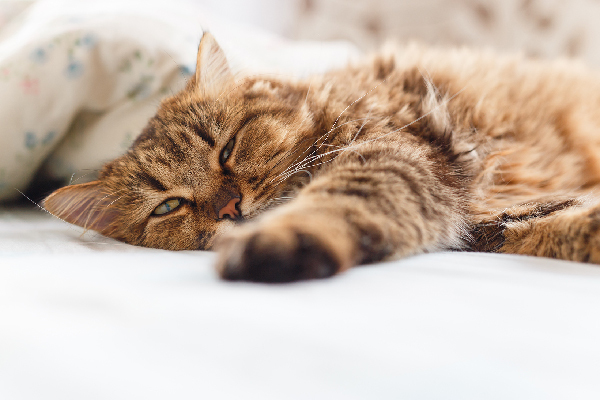 Raw or unripened potatoes are potentially toxic to cats. They are, like tomatoes and eggplants, members of the nightshade family. Their skin, as well as the vines they grow on, contain a defense toxin called solanine, which can be poisonous to cats. Cooked, baked, or mashed up without any toppings or spices, a small helping of potato should not cause a cat any real trouble, digestive or otherwise. 6. Can cats eat onions? Where cats are concerned, after the salt found in bacon and corned beef, onions are by far the most dangerous component of a corned beef and cabbage meal. Onions, garlic, and other plants in their family damage a cat’s red blood cells, restricting their capacity to carry oxygen effectively. 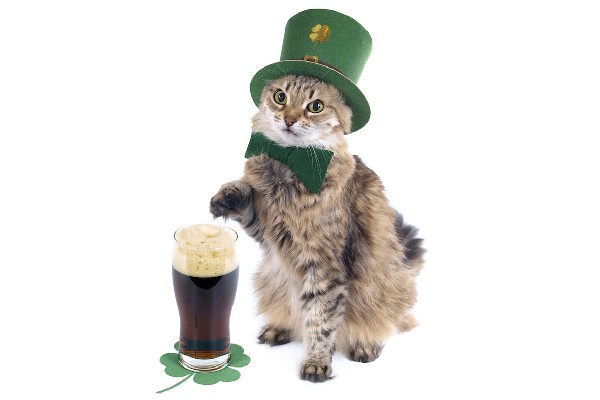 Happy St. Patrick’s Day to you and your cats! Even isolated, the most frequently used ingredients in a St. Patrick’s Day corned beef and cabbage feast offer no real benefits to you cats. 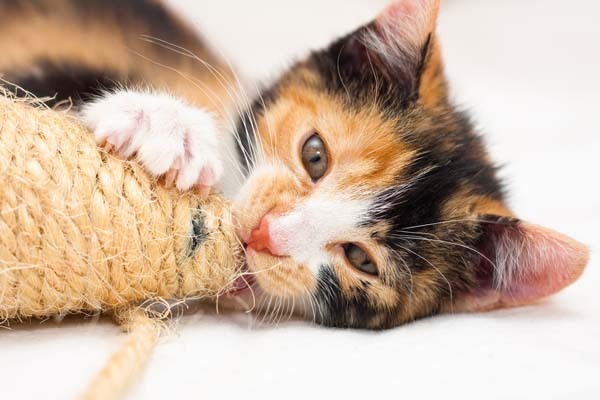 Delicious as the meal may be to humans, by the time it’s served to your family and friends, your cat is better off with her regular kibble or canned cat food. If your cat is determined to be involved in the festivities, feel free to put a few drops of food coloring to dye their water dish green! Thumbnail: Photography by Viacheslav Zhukovskiy / Shutterstock. Melvin Peña trained as a scholar and teacher of 18th-century British literature before turning his research and writing skills to puppies and kittens. He enjoys making art, hiking, and concert-going, as well as dazzling crowds with operatic karaoke performances. He has a 16-year-old cat named Quacko, and his online life is conveniently encapsulated here. Can Cats Eat Artichokes or Asparagus? Can Cats Eat Granola Bars?